Yamaha Develops New PW Series for European E-Bikes - News Releases | Yamaha Motor Co., Ltd.
IWATA, August 28, 2013 — Yamaha Motor Co., Ltd. (Tokyo: 7272) announced that it has developed a new electrically power assisted bicycle (e-bike) system kit — the PW series — especially for the European market. As a first step, Yamaha will begin supplying the drive unit developed as part of the system kit to Giant Electric Vehicle in October 2013. Yamaha's PW series answers the European market's demands for layout flexibility by offering one of the world's smallest and lightest center-mount drive units, with a weight of just 3.5 kg excluding sprocket. This drive unit transmits motor power to the crankshaft directly, producing a maximum peak torque of 80 Nm and a maximum continuous torque of 70 Nm. In addition, the PW series is equipped with the triple sensor system, offering powerful yet smooth delivery. The display and battery are also newly developed in a bid to satisfy discerning customers in Europe. Giant Group will release a Giant-branded e-bike featuring Yamaha's PW series drive unit. Their 2014 e-bike lineup is due to be unveiled at EUROBIKE, one of the largest bicycle exhibitions in the world, held in Germany from August 28. Europe, a major market for e-bikes, saw sales reach over 850,000 units in 2012 (Yamaha survey). Germany and the Netherlands accounted for over half of the market. 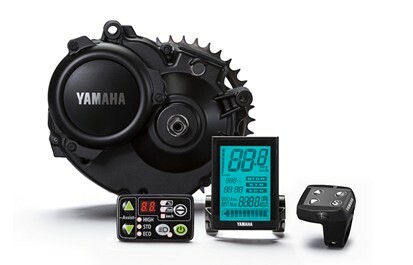 Yamaha is strengthening and expanding its partnerships with European bicycle manufacturers by supplying them with e-bike system kits, aiming at 100,000 units by 2015.